Two years ago Eagle Cleaners partnered with Kreussler Inc., the garment care industry’s leading innovator of solvents and technologies, when it was time to replace our aging dry cleaning machine that used perchlorethylene (Perc). After much research we decided on Kreussler’s Systemk4 a non-toxic, biodegradable, halogen-free, energy saving solvent. The results have been outstanding. Our new system provides the same results or better than perc with low risk for damage to trim and ornamentation as well as exceptional solvent mileage and without any of the environmental or health related concerns. In a time of increased government regulations, economic and environmental demands, Kreussler is setting new standards with SYSTEMK4, and, in the process, changing the dry cleaning industry worldwide in a sustainable and positive way. The solvent known as Solvonk4 is composed of Carbon, Hydrogen and oxygen. The carbon portion is derived from corn. 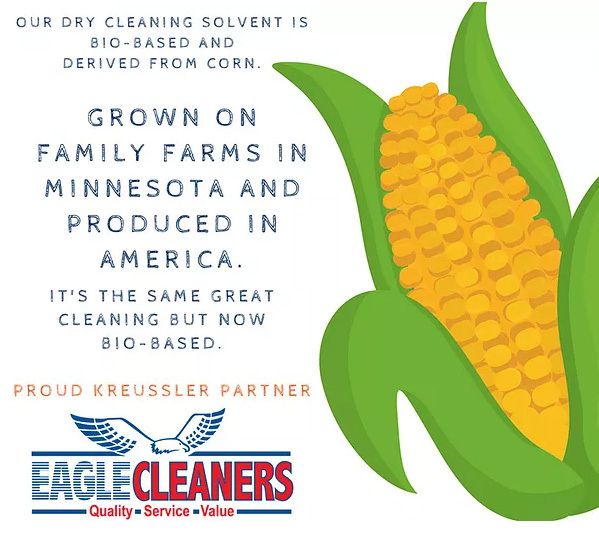 Best of all Thanks to work of Green Biologics and their facility in Minnesota we are now making dry cleaning solvent from corn grown by about 500 family-owned farms in the heartland of America. Bio-derived and sustainable are words never before applied to the dry-cleaning industry until now. Eagle Cleaners is proud to be a part of supporting American farmers and their families while lessening our carbon footprint on the environment. • Where did the raw ingredients come from? • How much energy was used to make this? • What are the waste streams that resulted? • What will happen when I am done with it? continue to provide you with exemplary dry cleaning services.